Academic literature on international comparisons of social policy has focused on programmes such as unemployment benefits and old age pensions. In contrast, social assistance benefits have received considerably less attention. This is remarkable given the importance of social assistance and minimum income benefit schemes. For many households in Europe and other OECD countries these benefits provide an important safeguard against low income and poverty. This is even more the case since unemployment rates started to increase as a result of the financial crisis. The question is then, why have social assistance benefits received so little scholarly attention? One possible answer to this question is that there has been a lack of indicators that can be used for international comparisons. In order to compare the development of social assistance benefits across countries and over time we have constructed a new indicator, the net minimum income benefit replacement rate, for 33 countries for the period 1990-2009 (Wang and Van Vliet, 2016a; Wang and Van Vliet, 2016b). This replacement rate is defined as the ratio of net minimum income benefits to the net average wage. To calculate the net minimum income benefit replacement rate we used data from the Social Assistance and Minimum Income Protection Dataset (Nelson, 2013) and followed the same procedure used by Van Vliet and Caminada (2012) for the calculation of net unemployment benefit replacement rates. Hence the replacement rates for social assistance and unemployment benefits are fairly comparable. Figure 1 shows the developments of replacement rates for 26 countries between 1990 and 2006. Here we present averages of the replacement rates for three household types: single person households, lone parent households with two children, and two parent households with two children. We took the average income from work. Interestingly there is considerable variation in replacement rates across countries. In 2009 the highest replacement rates can be found in Luxembourg, Italy and Denmark. The countries with the lowest replacement rates are the United States and Estonia. When we look at developments between 1990 and 2009 replacement rates decreased in the majority of countries. The largest decreases can be found in the Czech Republic, Slovakia and Sweden. Compared to these decreases the increases in the countries where the replacement rates increased are rather small. A first explanation for the decline of minimum income benefit replacement rates that one might think of is the financial crisis. During the financial crisis many governments adopted austerity measures in order to reduce budget deficits. However the fact that the bulk of these measures were taken after 2009 leads us to the conclusion that we must think of other explanations for the developments between 1990 and 2009. Of course one could think of numerous economic and political factors which vary from country to country and from year to year, but here we aim to sketch some more structural explanations. A classical explanation for lower social protection levels in the political economy literature is globalisation. Increased imports and exports of commodities and financial flows which are becoming more international may trigger a form of competition between governments on tax rates and social contributions. In order to provide attractive conditions for firms, governments reduce taxes and social contributions, resulting in smaller budgets for welfare state programmes. As economic globalisation has progressed substantially between 1990 and 2009 – think of (amongst others) the establishment of the European Single Market, several rounds of enlargements of the European Union, and the upsurge of Chinese trade – this could be one of the factors that has contributed to lower social assistance benefits. A second explanation for the decline of minimum income benefits relative to wages is the budgetary pressure stemming from the ageing of the population. With larger proportions of older people, public expenditures on old-age pensions and healthcare increases. This might result in smaller government budgets for other welfare state programmes, such as social assistance benefits. Hence this crowding-out effect could be an explanation for the decline in minimum income benefits. A third explanation for declining replacement rates is the growing attention given to activation. At a high level of abstraction, welfare state programmes can be classified into ‘passive’ and ‘active’ programmes. Passive programmes can be understood as programmes that entitle people to benefits, whereas active programmes are aimed at citizen participation in the labour market. So, for example, unemployment benefits and social assistance benefits are passive programmes, whereas labour market training and employment services are active labour market policies. In the period 1990-2009 there has been a lot of attention given to activation policies. Supported by several advices, reports and coordination initiatives from the OECD and the European Commission, activation has obtained a prominent place on the policy agenda in many countries. An increase in expenditures on activation policies might put pressure on budgets for passive policies. Hence this crowding-out effect might be an explanation for the decline of minimum income benefit replacement rates. The tentative explanations for the developments in minimum income benefits described above need to be scrutinized. This forms an interesting research agenda for the coming years, as comparative welfare state literature has not paid much attention to the drivers of changes in minimum income benefits. Studies should be focused on the different elements of benefit packages (social assistance benefits, child supplements, housing benefits), the various systems of indexation and other institutional characteristics such as eligibility conditions, work requirements and benefit sanctions. In order to understand the dynamics of minimum income benefits both explorative quantitative analyses and in-depth case-studies are needed. For now we have shown that in many OECD countries minimum income benefit levels have relatively declined over the past decades. This is a noteworthy observation in itself, as a widening gap between the levels of minimum income benefits and wages contributes to increasing income inequality. Nelson, K. (2013) Social Assistance and EU Poverty Thresholds 1990-2008. Are European Welfare Systems Providing Just and Fair Protection Against Low Income? European Sociological Review 29(2): 386-401. Van Vliet, O., and K. Caminada (2012) Unemployment Replacement Rates Dataset among 34 Welfare States 1971-2009: An Update, Extension and Modification of Scruggs’ Welfare State Entitlements Data Set. NEUJOBS Special Report no. 2. Van Vliet, O., and C. Wang (2015) Social investment and poverty reduction: A comparative analysis across 15 European countries. Journal of Social Policy 44(3): 611-638. 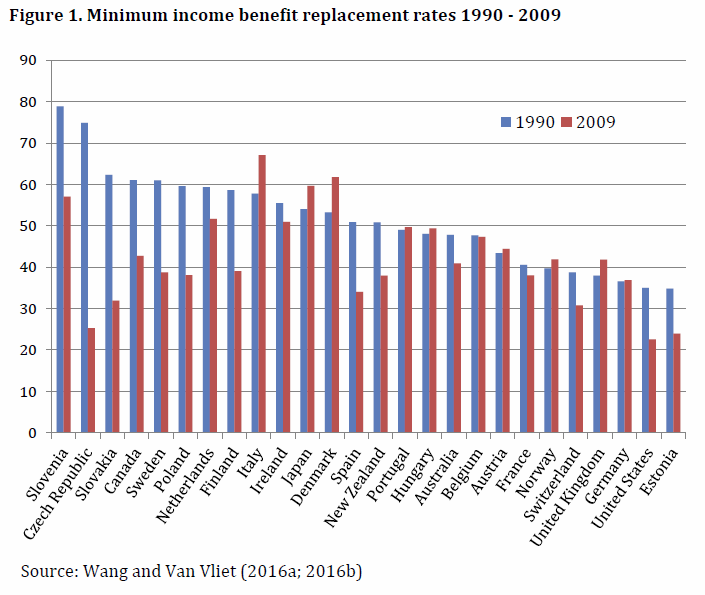 Wang, J., and O. van Vliet (2014) Social assistance and minimum income benefits: Benefit levels, replacement rates and policies across 33 countries, 1990-2009. Department of Economics Research Memorandum no. 2014.04. Leiden: Leiden University. Wang, J., and O. van Vliet (2016a) Social assistance and minimum income benefits: Benefit levels, replacement rates and policies across 26 OECD countries, 1990-2009. European Journal of Social Security 18(4): 333-555. Wang, J., and O. van Vliet (2016b) Social Assistance and Minimum Income Levels and Replacement Rates Dataset. Leiden University.